Disclaimer: I’m not super great at rhythm games. Give me a controller for Guitar Hero and I panic over the onslaught of button presses if it’s above Easy difficulty. However, maybe I just don’t have enough experience with the genre in general if I’m using Guitar Hero as a reference. With that self deprecation aside, I’m here today to review a rhythm game called Lost in Harmony. 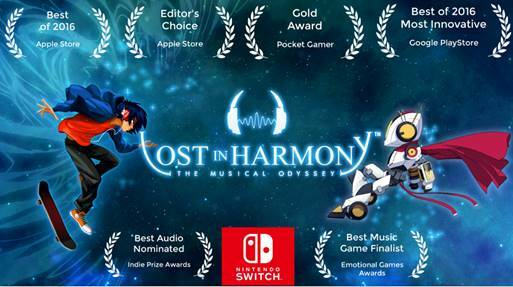 Originally on Android and iOS devices, Lost in Harmony feels right at home with the portability of the Nintendo Switch. The game is divided into two parts: Kaito’s Adventure and M.I.R.A.I.’s Escape. You have the choice to start either one first or go back and forth between them at any time. Gameplay between the two is identical: each level has you playing as either the teenager Kaito or the rogue robot M.I.R.A.I. as they avoid obstacles in the road and occasionally input button presses in rhythm to the music. A tutorial wasn’t given at the beginning of either story, but the interface is so intuitive that it’s pretty much self-explanatory. The higher your combos, the more points you get. Also, special trails and bonuses exist on the road. Thankfully, only a few times did the game force me to balance avoiding obstacles and pressing button combinations as the same time. However, those few times made it difficult to balance the background navigation and the overlay display. You can either use the Joy-Con, a pro controller, or even the touch screen to play the game. As I mentioned earlier, I’m terrible at rhythm games. However, I feel like Lost in Harmony is a good place to start with beginners to the genre. Normal difficulty is fairly forgiving. As long as you can get an accuracy of 50 percent or higher, you are allowed to continue to the next level of Kaito’s Adventure. For M.I.R.A.I.’s Escape, more levels are added in bulk instead of one at a time, so you can completely fail a level but still be rewarded more if you beat some of the other levels. Both sides proved more difficult halfway through, though not impossible. If you want more of a challenge, the game does offer a Hard difficulty as well, making the game more at home for fans of the genre. You can’t have a rhythm game without music. A lot of Kaito’s Adventure takes classical music and adds a spin to it, like a dubstep remix. The tracks seemed to match more with the dreamlike feel of Kaito’s story. On the other hand, M.I.R.A.I.’s Escape contains original music with a list of song titles and artists available with a press of a button. The songs are nice and match the flow of the levels perfectly. Visually, Lost in Harmony is a charming game. Both parts use beautifully animated sprites on top of 2D backgrounds. The characters you play even give you hints for gameplay. 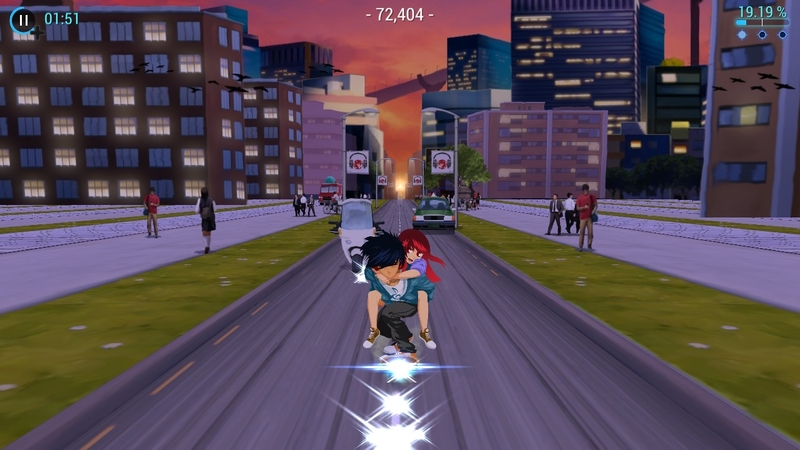 For example, Kaito rides on a skateboard with his girlfriend Aya. If an obstacle is coming up, Aya will occasionally point ahead with a worried expression. Likewise with M.I.R.A.I., the robot will change his facial expression if danger is approaching. Let’s talk about the story of Lost in Harmony. I usually prefer to discuss a game’s story sooner, but I would say this is one of the game’s weakest aspects. As you probably guessed, Kaito’s Adventure and M.I.R.A.I.’s Escape have their own stories. Both are completely different from each other. Kaito’s story follows him and his dreams with his girlfriend, Aya. The bulk of his story is told through text messages between the two. Aya is ill with an unknown disease, but Kaito explores the world (and universe) through his dreams with her. It’s a really touching story, though the plot can be really bare bones. M.I.R.A.I.’s Escape‘s story is a bit scattered. You play as M.I.R.A.I., a robot that escaped from Dr. Mute’s laboratory. It arrives on Earth, on the run from Dr. Mute and from the evil Nor Commandment. Between levels, you receive messages from Dr. Mute, Nor Commandment, and look at news headlines that show how M.I.R.A.I.’s presence has affected the world. But that’s as far as the plot goes. The dialogue is weak in comparison to the other story, with some of the grammar being almost incomprehensible. Lost in Harmony is perfect to kill time on the go. Levels last between two to three minutes. Unfortunately, there isn’t much game for the long run. Kaito’s Adventure is 14 levels long and M.I.R.A.I.’s Escape is 12 levels. However, both stories use many of the same levels but just with different music playing. 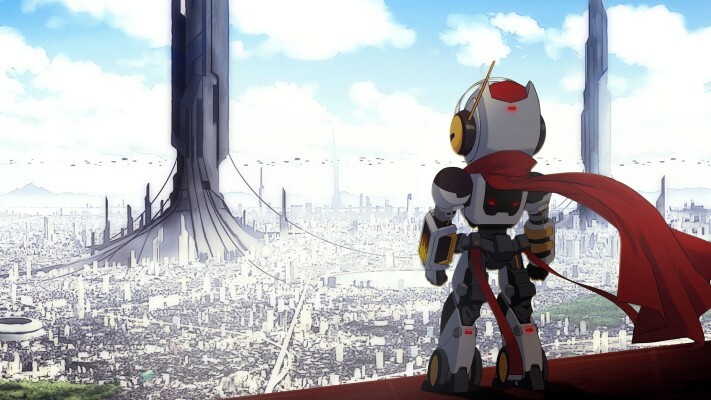 Whereas the levels are seen as dreamlike during Kaito’s story, the levels are seen as literal for M.I.R.A.I. 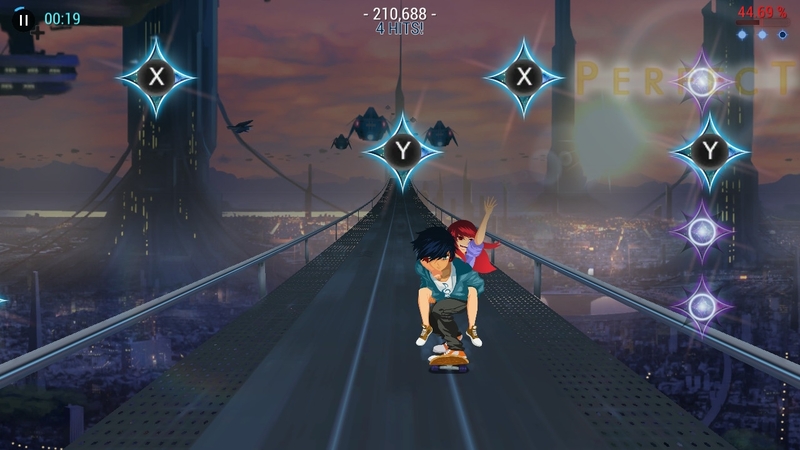 Of course, you have Hard difficulty to extend the game longer, and there are unlockables, such as different clothes and skateboards for Kaito and different light colors for the robot, but these are purely aesthetic. Lost in Harmony is a charming game that is perfect for newbies and long-time players of rhythm games. The music fits the mood of both stories. However, with its limited amount of unlockables and levels in general, you will probably finish the game in a few hours. That might not be a bad thing for its $6.99 price tag on the Nintendo Switch. Lost in Harmony is now available on Nintendo Switch and PC. Though with its short and mobility focused nature, I highly recommend checking the game on on either Nintendo Switch or mobile devices. Previous Post:OPINION: Where Do I Start?